What's the Cost of Installing a New Garage Door? A garage door is an important part of your house, both aesthetically and functionally. It can take up as much as 30% of the face of your house, and faulty, improperly insulated doors can leave your home vulnerable to the elements. In cold-winter cities like Minneapolis, garage door drafts can substantially raise heating costs. Installing a garage door is not typically a do-it-yourself project. Unless you have the proper skills and experience, a professional garage door installer should be contacted. Depending on the style, material, and size of the door you choose, the price can be as low $400 or as high as $3,000. There are three common types of garage doors: Tilt-up, roll-up, and sectional. The tilt-up model consists of a single door, set on hinges, which is lifted and pushed into the garage. Though this model tends to be about 30% less expensive than the other two, it takes up driveway and garage space and is not as common as the other types of doors. Additionally, tilt-up doors are less weather-proof than the other models. As a result, in rainy seasons leaks may develop and cause flooding, requiring you to contact a plumber. An average sized, two-car (16x7 foot), tilt-up garage will typically cost $400 -$700 with installation, depending on the material. A roll-up door is made up of many small panels attached together, and set on hinges. When opened, it coils up overhead into a tight roll. This type of door takes up less overhead space and is more insulated than the tilt-up model, but it’s more expensive and requires periodic maintenance. Typical costs of an average-sized roll-up door run from $850 - $3,000 with installation, depending on the material. A sectional door is made up of fewer panels than the roll-up door but functions in a similar way. Instead of coiling up into a tight roll it slides into the garage on an overhead track. This track can be raised higher than the opening so that it takes up less space. An average-sized sectional door typically costs between $750 and $2,000 with installation, depending on the material. All of the doors can be installed to function either electrically, manually, or both. Electrical openers typically cost between $150 and $300 but may be included in the price of the door. Garage doors are most commonly made out of wood, steel, and aluminum. Aluminum is the least expensive material and comes in the largest variety of colors. It’s lightweight and doesn’t rust but can dent easily. 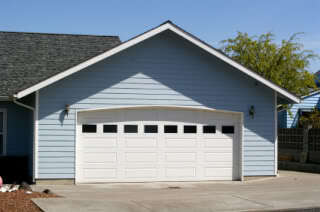 Wood garage doors come in many varieties and can be painted any color but are expensive and require regular upkeep. Steel is the most popular material and requires the least amount of maintenance. Installing a new garage door can add functionality and beauty to your home at a relatively low cost compared to other home improvement projects, but be sure to hire a reliable professional to do the job.